Lotus Ensure Toilet rolls for the Lotus toilet tissue system. This white Lotus Ensure Compact toilet roll holder, holds two 900 sheet Ensure Compact toilet rolls. The Lotus Ensure toilet roll holder is an innovative, stylish and lockable dispensing system, the Ensure compact toilet roll holder is also fully enclosed offering greater hygiene benefits than any other type of dispenser. 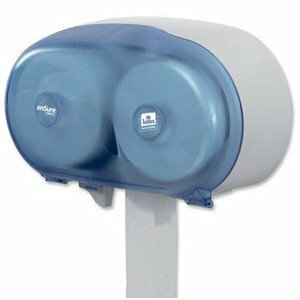 This dispenser is designed to hold two Ensure compact 900 sheet toilet rolls at any one time. The high capacity dispensing system requires refilling less often and is also quick and easy to top-up-in-use so that the dispenser need never run empty, therefore reducing service costs and reduced wastage. The Lotus Ensure compact toilet rolls used with this dispenser have a no 'leave-behind' core as they are a coreless toilet roll therefore no core, no mess, no waste means tidier washrooms.